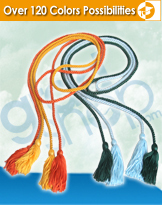 Graduation Honor Cords, also referred to as honor chords or recognition cords can be found on sale at Graduation Shop. Our Graduation Honor Cord departments include Elementary Graduation Honor Cords, Middle School Graduation Honor Cords, High School Graduation Honor Cords and College Graduation Honor Cords. Choose from many different styles and colors that will compliment your other graduation apparel being worn. Browse through our complete selection of single and double honor cords and choose what works best for your graduation ceremony.